Anza Trail School welcomes the involvement of parents and community members in its schools. Volunteers play an important role in assisting our outstanding staff and in providing real-life experiences for students. 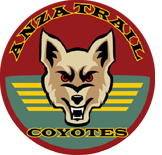 You are encouraged to become involved with Anza Trail School and help enhance student learning!